Samsung Galaxy S4 LTE-A launched as the first modern smartphone ushering us in the era of 1 Gbps theoretical carrier network download speeds, with the unveiling of the first broad scale LTE-A network in the world by SK Telecom in Korea, which has been in development since at least 2011. The phone is powered by the fastest Snapdragon chipset of the 800 family that is commercially available, since Qualcomm is, as you can easily imagine, the leader in 4G LTE radio development as well. LTE-Advanced is much more than theoretical download speeds of up to 1 Gbps, however. Its main added value is in terms of traffic load distribution and accompanying services that will be made possible with its rollout. It will take years for carriers to take full advantage of all the awesome features made available to them with LTE-Advanced, so check out the wrap below, and dream of the times this year and the next, when US carrier networks will upgrade to this technology as well. The first stage of SK Telecom's LTE-Advanced deployment can reach theoretical speeds up to 150 Mbps, and reporters at the presentation were greeted with 100 Mbps speed demos. 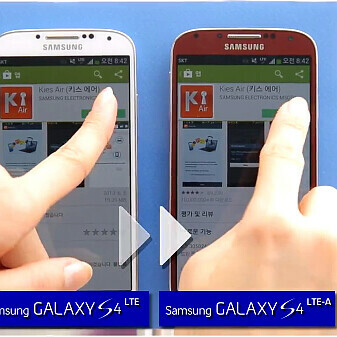 To demonstrate how much faster your Galaxy S4 LTE-A will download, compared to the regular S4, Samsung staged a real-life test on the streets of Seoul, and, as you can see in the video, the results are twice a-blazing. The peak theoretical download speeds of the current Rel. 8 LTE networks is 300 Mbps, while for Rel. 10 LTE-Advanced it is 1 Gbps, which is a pretty significant difference, but still pales in comparison with the difference in upload speeds - 75 Mbps max for current LTE networks, vs the whopping 500 Mbps for LTE-Advanced networks, meaning that your pictures and especially video will be uploaded momentarily for the world to see. HetNets is the term used for a patchwork of technologies like 3G and 4G signal emitters - from regular towers, down to femtocells in your office - combined even with Wi-Fi routers for the broadest and cheapest possible coverage at the least energy expenditure. In the case of LTE-Advanced, the interoperability and seamless transition between all those sources of signal can be intelligently managed, including your next-gen smartphone in the process, for meeting the "1000x challenge" as Qualcomm puts it, which is the predicted 1000x explosion of data usage worldwide in the next few years. "LTE Carrier Aggregation enables a network operator to combine radio channels within the same frequency band or across different bands to achieve much higher data rates and lower latency than otherwise would be possible. In principle the LTE Advanced standard will allow for the aggregation of up to five carriers, each of up to 20MHz, to achieve a total effective bandwidth of 100MHz, although early implementations will be limited to two carriers and therefore a maximum of 40MHz." All the LTE-A advantages listed so far result in reduced cost per bit delivered for carriers, which should mean cheaper data for the end consumer, or more data allotment for the same price, all else being equal. History lesson: The Me-262 Schwalbe entered production far too late into WWII to make a difference for Germany. However, has proved to have been an invaluable reference point in design. So yes, even if the GSIV LTE-A isn't mainstream, it's far from useless. If anything, bragging rights is exactly what it is. Why dont they try installing 2 radios for LTE for fast response? As tried with WiFi that way works better. Yet good for anyone with an SII or SIII... or any handset from comparably the same timeframe. Buyer's remorse is simply a fact of life, especially when it comes to tech products. I agree, i feel sorry for those people. Octa before was the talk of the town. After the all the benchmark testing. SD800 owns everything. Because this is a korean market special just like the GS3 with LTE and higher clock Exynos quad w/2GBs of ram that was released last year? Meh, we have a sparse 4G /LTE coverage in Sydney AU as it is, by the time we have LTE-A it will be at least 3 years from now and it will be a different landscape in mobile devices by then. But hey, it''ll be nice to know I can pick up one of these phone for around $100 by the time I get to use it a full throttle. I just wanted to point out that Qualcomm is based in California, not Texas. I may be missing a legit reason for you to refer to Qualcomm employees as "the Texans from Qualcomm," but I don't think I am. I have to say LTE-A's speed is uber fast. However, as an user on AT&T in a small town in PA... I haven't even gotten LTE yet... hopefully AT&T will keep their promise and deploy LTE-A faster than Verizon. I wouldn't hold my breath waiting for AT&T to beat VZW in rolling out LTE-A. VZW already has started pilot LTE-A installs. AT&T is more talk and less action. I can't wait to have this LTE-A on my iPhone 5; it should really improve data speeds. Wow, Mr Dark Jedi, you certainly have a lot of faith in them .... Good Luck? How dare you speak iLL of Apple; they will have LTE-A or my name isn't Dorothy Gale. No way will your iphone 5 ever recieve LTE-A. Iphones have been behind in every technological advancement in the past 2 years. And they will continue to get further behind. Case and point: samsung has phones with octa core processors. Thats 8, if you didnt know. The iphone 5 has a dual core processor. Thats 2. For verizon, The HTC thunderbolt was the first 4g-LTE capable phone, released 2 1/2 years ago. So judging by the same timeline, itll be 2 years from when u.s. recieves LTE-A that the iphone may possibly get it. You're welcome. Sammy should've just been releasing the gs4 now. This makes like 7 variants of this phone, so glad I waited. Ip5s, and note 3 for DJ. Early adopters have gotta be fuming at the way Sammy's held back to keep this thing going. Man that's gotta tick of consumers though. My question is: How will this effect battery life? I mean, LTE drains batteries more than just 3G or "4G", what kind of battery life would a GS4 with LTE-A have comparatively? and what about those GB limits/month! guess everyone will just hit there limits much faster! except sprint and tmob!